Blog | TeelFit Training | Change happens today. BEFORE CLASS: Arrive to the gym early and warm up. Whether it’s a lap around the track, five minutes on the stair master, or light weight lifting, show up to the room warmed up and ready to go. The second the music starts, we’re giving it 100%. DURING CLASS: Each class is divided into two segments, typically split into strength-based and cardio-based training. Stay for one or stay for both. Equipment may include kettle bells, sandbags, dumbbells, barbells, benches, bodyweight and more. No matter what equipment is being used during the segment, expect to work harder than you ever have before. AFTER CLASS: Take a few minutes to cool down and stretch. This will prevent injury and ensure you are ready for the next round. The historical “I don’t have enough time” is no longer an excuse. Check out a DIRTY30 class at your favorite LVAC Location. Classes listed at lvac.com. Track 2 (Squats)— All about endurance. Six and a half minutes of squats, little recovery. We spike the heart rate and build muscle tension. Track 3 (Chest)— Fun song, continuous tension. The last set is the toughest, we go all out until the finish! Track 4 (Back)— Holy wide rows! I’m taking emphasis off of the clean press this week and focusing on the rows. You’ll feel it in the upper back. Track 6 (Biceps)— Very short and efficient Bicep track this week. No recovery, maximum effort. Track 7 (Lunges)— We’re firing up the glutes and pushing up the heart rate with lunge propulsions! Track 8 (Shoulders)— Fun song, maybe some hip shaking. We take it home with plenty of overhead presses and pec decks! Track 9 (Abs)— lots of pulsing crunches to fire up the midsection, toning the 6 pack. Join me for 3:15pm BODYPUMP Sunday at Las Vegas Athletic Club– Northwest Location. Otherwise, here are my other weekly BODYPUMP classes…. It’s been a minute since I’ve posted on the site. But, I have something very exciting to talk about. If you’ve followed my posts on Facebook recently, you’ve probably noticed that I’m obsessing over a new class format– SANDBAG XPRESS. The class is LVAC exclusive, and yet another reason as to why Las Vegas Athletic Club is leading the way in the fitness industry. This new format truly changes the game when it comes to working out! 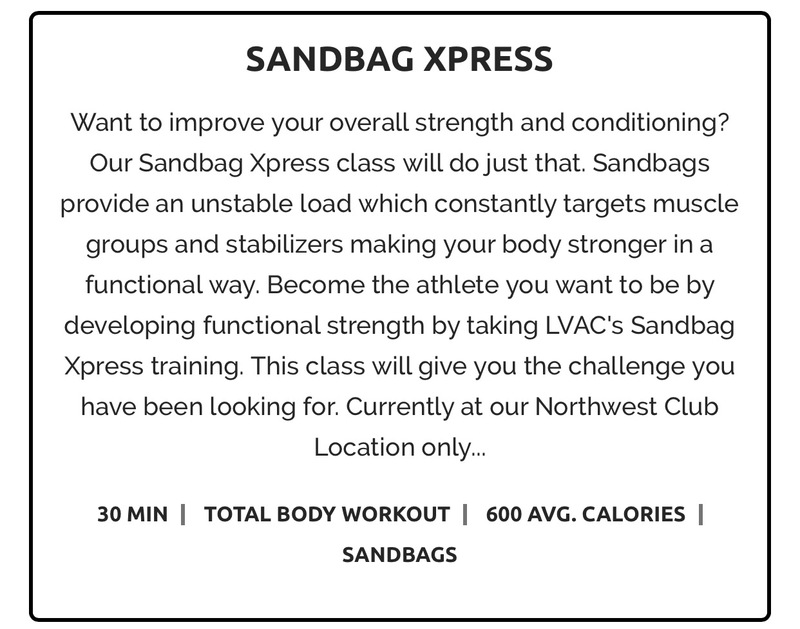 SANDBAG XPRESS is unlike any other fitness class. Definitely not the stereotypical old-school classes that come to mind. I can’t think of any other class in which you slam sandbags on the floor, run laps around the room with a sandbag over your shoulder, and perform numerous other intensity-driven exercises. In this class, we work out like athletes and leave the room champions. Join me 5:15pm on Thursday nights at LVAC Northwest (upstairs in Room 2). Only 30 minutes of work, but you’ll get the workout of your life. Test your fitness limits and leave the room stronger than ever before! Vegas peeps, you’ve GOT to check it out. This week’s focus in my BODYPUMP classes has been the plyometric bench jump. The key to this move is to land soft and control the body. This will protect the knees and isolate the working muscles. Start easy, get a feel for the movement and range, and then add some explosion! This move is sure to elevate the heart rate and challenge the legs. Workout Wednesday: As if leg day didn’t already hurt enough. Alright, there’s a few things we need to catch up on cause once again I’ve been the world’s most inconsistent blogger. All of the back to school / BodyPump job searching / college prep stuff has been taking up all of my spare time! Excuses, excuses, yeah I know 😉 Since we’ve last spoken, a few things have happened. 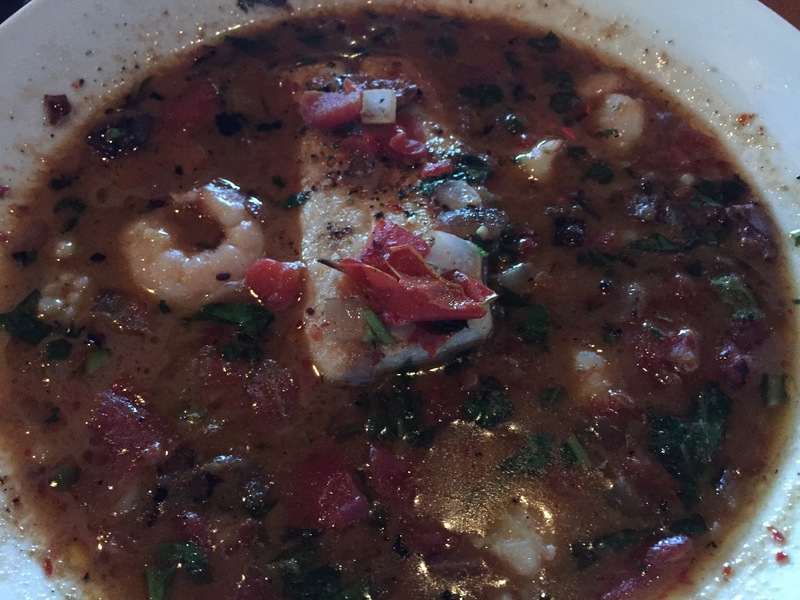 One, I had this fantastic meal from BJ’s.